Russell Davies: well, have you? We've finally finished our first Homesense project. It took so long because we went wildly beyond the scope of the project and the hardware you're supposed to use and even more wildly beyond my technical abilities. So Daniel has had to be very kind and patient with us. However. 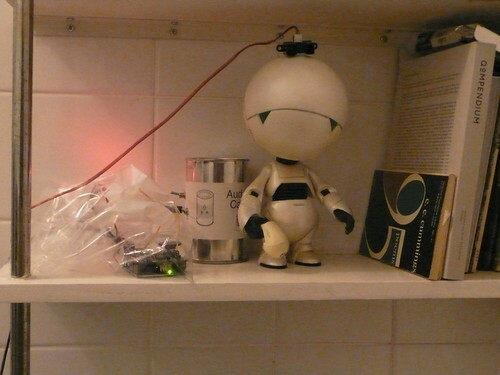 Marvin The Discrete Reminderer is now up and running and sitting on the shelf in our bathroom, opposite the toilet. These were recorded by Arthur and mucked about with in Record. And why have we done such a stupid thing? Not sure really - partly to see how to do it but mostly to honour Arthur's first idea. He wanted Marvin to talk. This was a useful thing for him to talk about. So we did it. Think of it as proto-RodneyComp.